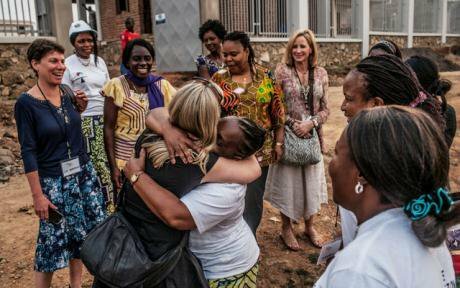 Rachel Vincent, Liz Bernstein, Leymah Gbowee and Julienne Lusenge meet with sexual violence survivors in the Democratic Republic of Congo, 2014. Photo: Peter Müller When I was 10, I was an avid reader and particularly loved reading biographies. I vividly recall reading short, child-versions of biographies about Florence Nightingale — the nurse who pioneered the use of hygiene in field care and saved countless lives on the front lines during the Crimean War — and biographies of Sojourner Truth and Harriet Tubman, two African Americans who had bravely made their way from the South to the North to escape slavery. Harriet Tubman traveled mostly at night, and used moss — which grows on the side of the tree that gets the least amount of light, the north side — to guide her to freedom. To this day, while walking in the woods, I find myself checking on which side of the tree the moss is growing. It is perhaps not surprising then that as I grew older, I sought out books written by and about women. In my turbulent teens and 20s, it was the lives and experiences of women I had never met — writers like Harper Lee, Sylvia Plath, Maya Angelou, Nawal El-Saadawi, Gloria Naylor, Julia Alvarez and Arundhati Roy — who helped me to feel less alone in this world. Their collective wisdom pointed me towards a new kind of North, an interior freedom; they showed me that there are many ways in this world to be a woman, and that fear was normal, but so was boldly refusing to accept things as they are. In 1983, when I was 18, my mother gave me a copy of Carol Gilligan’s book, In A Different Voice. This book posited the theory, ground breaking at the time, that women and men have different approaches to morality. Gilligan’s work has since been knocked off its pedestal, but the core idea that women and men have different “voices” and ways of being in this world has always stuck with me, and in ways big and small, has shaped my life. Fast-forward more than 30 years. I now find myself working with six extraordinary women Nobel Peace laureates at the Nobel Women’s Initiative. The initiative’s leader, Liz Bernstein, shares not only a passion for feminism and peace work with me, but also a deep love for the writing of women and women’s stories. During human rights delegations to countries like South Sudan, Honduras, and the Democratic Republic of the Congo, Liz and I fill time on planes or buses discussing books we love, especially ones that celebrate the stories of women who have rejected militarism, violence and hatred (in its many forms) and have bravely forged ahead unapologetically as peacemakers. After many years of amplifying the voices of women’s rights activists around the globe for the Nobel Women’s Initiative, I decided to curate a book celebrating 100 years of remarkable peacemakers. 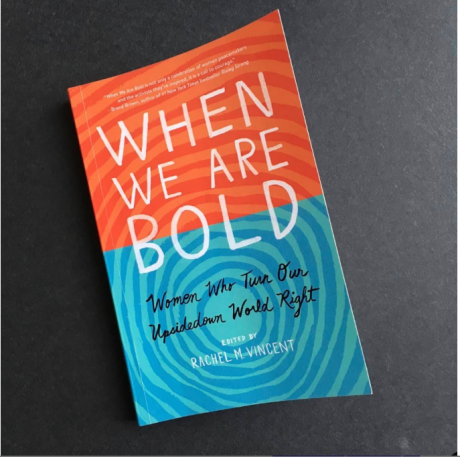 The book is called When We Are Bold: Women Who Turn Our Upsidedown World Right ! Published by Mapalé, 27 September 2016. When We Are Bold: Women Who Turn Our Upsidedown World Right ! Editor, Rachel Vincent. Published by Mapalé. We all stand on some pretty broad shoulders in the peace movement, and I wanted to honour those who led the way—and who have influenced and shaped other women. The result is a unique collection of 28 short profiles of women who work boldly for change, by the women writers, thinkers and doers they inspire. Some of the women in the book you may recognize, including seven women Nobel peace laureates. Other women in the book are not famous, but should be. The women come from all over the globe, including France, Liberia, Uganda, the Democratic Republic of the Congo, South Africa, Israel, Jordan, Russia, Mexico, Honduras, Canada and the United States. We are reprinting three essays from the book here on openDemocracy 50.50. In her essay, scholar and writer Valerie M. Hudson explores how feminist icon Gloria Steinem, now in her 80’s, is still working for a shift in foreign policy based on the feminist goal of peace. In her essay, feminist economist and former New Zealand politician Marilyn Waring takes us back to the early 1980s, when Dr. Helen Caldicott paid a well-timed visit to New Zealand and helped move public opinion closer to the decision to make New Zealand the first nuke-free country. In her essay, filmmaker Fiona Lloyd-Davies honours Congolese activist Rebecca Masika Katsuva. Masika, herself a survivor of sexual violence, helped dozens of other survivors in her short life, and also become “Mama Masika” to so many of their children. The women profiled in these essays, are “extraordinary”. But at the root of that word is “ordinary”. Both the women writing and the women who inspire them are just like women you know. They are your mother, your sisters, your aunts; women in every community across this planet doing the hard, sometimes dangerous, and often lonely, work of challenging the status quo and responding to violence and injustice in its many forms. I hope you see glimpses of yourself in some of the women you read about in these essays. Perhaps some of them will even inspire you to follow the metaphoric moss on the north side of the trees towards boldness.